Wheels, Tires and other Exterior Talk about your rims, body kits, and other exterior mods here. The side of my garage jumped out at me and crushed my driver side mirror. The housing cracked, but the mirror glass, electrical components and reflectors survived. I need to take the mirror and electrical out of the damaged housing and transfer the new housing I bought from a dealer. However, the clips aren't very forgiving and I can't seem to pry them loose without fear of breaking something vital. Any tips on how to make this happen? I accidentally broke one of the clips on the existing housing, so I guess I could go that route, but I'd rather not out of fear of breaking my mirror or something electrical. 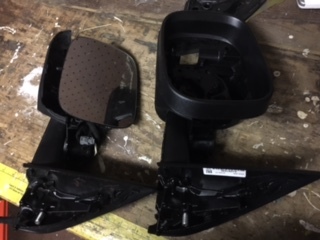 someone smashed my driver side side mirror casing. Anyone paint these rims black? ?